Click on Roster button above to Confirm Roster. 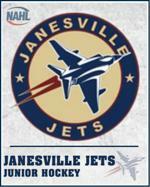 All players listed will be members of the Jr Jets going forward. Players who made the team will also receive an email so please keep an eye on your email for a communication from the coaches for further details. For those who were not chosen you did an excellent job. There was a lot of talent on the ice this year! Warmup Jackets, T-Shirts, Sweatshirts, Hats.